Heat oven to 400°F. Spray 9-inch glass pie plate with cooking spray. In medium bowl, stir Bisquick mix and oil until blended. Add boiling water; stir vigorously until soft dough forms (1 to 2 teaspoons more water can be added if necessary). Press dough in bottom and up side of pie plate. Sprinkle bacon, cheese and onions over crust. In medium bowl, beat eggs, egg whites, milk, mustard, salt and pepper sauce with wire whisk until blended. Pour into crust. Cover edge of crust with strips of foil to prevent excessive browning. Bake 30 to 35 minutes or until center is set. Remove foil strip. Let stand 10 minutes before cutting. For the best results we recommend using a mixture of eggs and egg whites. We tested this recipe using fat-free egg product, and found the flavor to be a bit bland and the texture slightly curdled. Look for cooked bacon strips near the lunch meat items at the grocery store. 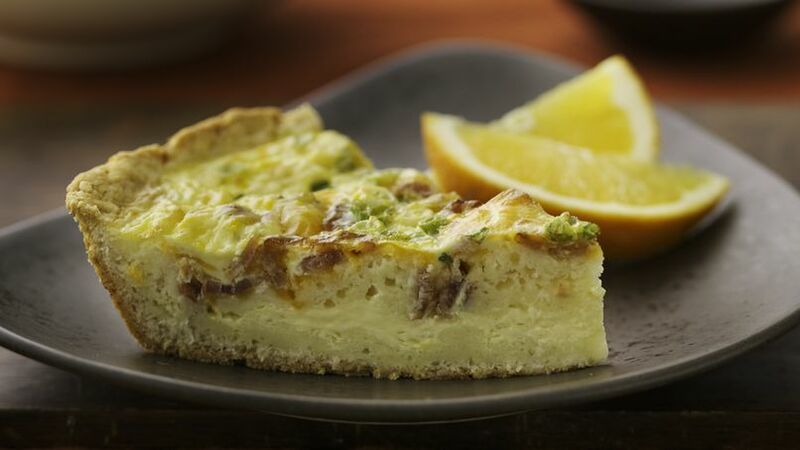 Say oui to this slimmer quiche - every slice will be a pièce de résistance!